We needed to replace a crap electric kettle, that I had purchased from Asda when we first moved in to our house. I did a lot of online research before deciding on the Bosch TWK8633 Styline Collection 1.5 Litre Cordless Jug Kettle, which had very good reviews on Amazon.co.uk. It’s a decent looking kettle, the black and silver colour goes with our kitchen. All of the controls are on the base of the kettle, not on the kettle itself. I liked to fact that you can select several temperature settings; 70c, 80c, 90c, and 100c. Being able to choose a certain temperature is very useful when you need hot, but not boiling water for certain recipes, and drinks etc. The only downside I can see is that our new Bosch kettle makes a very loud beep when you turn it on, and again when it’s reached the desired temperature. This could be an issue when you are making your morning brew, if you live in a small apartment and don’t want to wake up a partner etc. Other than the loud beeps, we like the Bosch TWK8633 Styline Collection 1.5 Litre Cordless Jug Kettle. Speaking of which, it’s time for a cuppa. 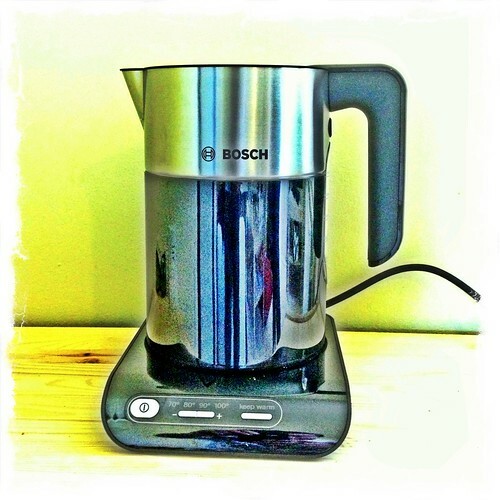 This entry was posted in Kitchenwares and tagged Bosch, Cordless Jug Kettle, TWK8633 on September 25, 2013 by Richard.